Tonight I had the luck to fall into my friend EllisDee Welinder's art show in Caledon Eyre (Caledon Eyre, 30, 116, 23). The art was gorgeous as well as disturbing. The theme, nuclear war. Reminded me of art from the Sandman graphic novels, complete with haunting subject matter. EllisDee said he'd been working for many months on this project, and was relieved to be able to move on. EllisDee and me. 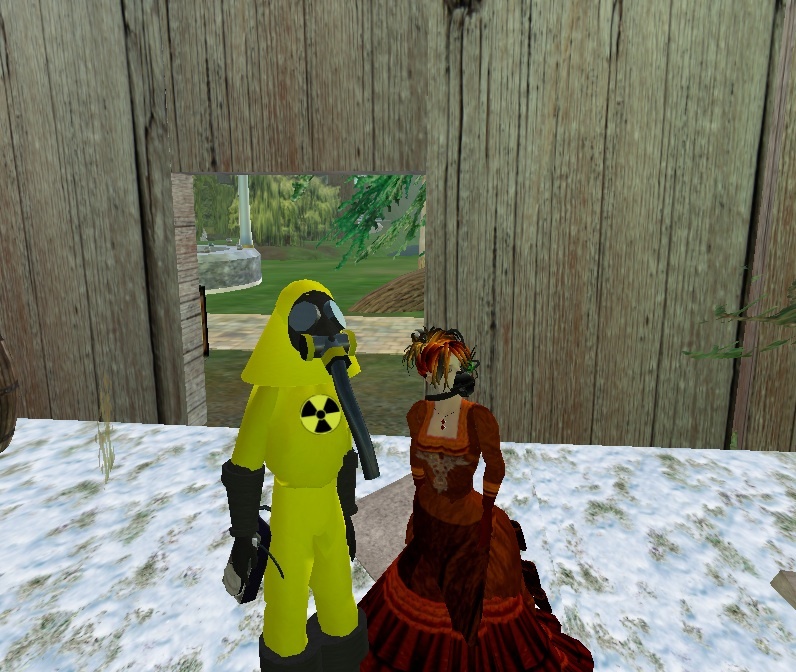 Nuclear war theme, hazmat suits. The gallery space was fabulously planned out. Nice marriage of form and function. Some of EllisDee's art behind me. One of the best exhibits I've seen in SL. Glad I had the chance to go. Thanks for coming by the installation and the exhibit. Thanks for the coverage of the event here as well. I appreciate your support and your patronage.